One of my earliest memories is not of my parents. Sometimes I wish it was that way but then I remember Drew when he was still a kid and I feel this fondness that makes everything better. When I was a little girl, I once visited my Great-aunt Margaret with my parents. She lived in a manor house far away from the city. All I cared about was the enormous gardens. I begged and begged mum and dad to let me play in the garden. The six year old me believed in elves, fairies and garden gnomes. That was the very reason why they were reluctant to allow me. I had a tendency to linger off and get lost. Maggie assured them that I would be quite safe; that the garden had fences and that the fences were intact. So, finally, they let me go. Grrrrr. The weekend is about to end. I don’t want the week to start. All I want to do is hit the pause button. The past few weeks have been really hectic and hectic doesn’t suit me. I love being busy. I love the feeling that I’m actually doing something with my life. I love learning and experiencing new things. But I need some me time! I need some time to maybe watch a movie. Read a book in one sitting. Just lie on my bed listening to music. Arrange my bookshelf. WRITE! But no. That doesn’t seem to be happening. I have German class five days a week. The other two days I end up meeting friends which is a good thing because I happen to have really amazing friends (don’t we all? ). But now, I’m unable to hear the thoughts in my head. Not even train time is sufficient. Let me explain train time. It’s the time I spend travelling, around 2 hours per day. And these two hours are sacred to me. I don’t talk to anyone, I don’t interact. I just listen to some music and let my thoughts wander. That’s what I do normally. Normal is no longer normal. So I end up sleeping. You can’t blame me either. I have to get up at 5 am and a morning person, I am not. Well, not every day. But thrice a week is frequent enough. And tomorrow is one of those days. 5am days. I hate them with a passion I have never experienced before. And it’s not like I’m functional either. I’m a zombie in need of caffeine at 5 am. I just wish I could sleep though. Anyway, here’s to a great week ahead! Last two weeks have been crazzzy! First there was all the preparation for my college fest. Then there was the actual fest. Blitzkrieg is a big deal. It’s a BMM fest after all, and KCBMM at that. Immediately after Blitz got over, I went ahead and registered myself for a course in German at the Goethe Institute in Mumbai. Actually since I had gone, the Queen of Procrastination that I am, on the day before the course was to commence, I didn’t get in at first. My mum was all serves you right. But my friend Dee was the one with me. She’s like a lucky charm or some kind of talisman. Really! I’m going to drag her along with me for job interviews. She assured me that someone would cancel and I would get the call. And hey pesto! Two minutes später, my cell began to ring. Yesterday was hellish. I had college at 7.30 am. Then I had nothing to do 10 am onwards and finally German class at 1 pm. I left after class and walked down to the station with a neue Freundin from MMB (or Max Mueller Bhavan ie the German class). She was planning on going for a movie at Alliance Française. They have free movie screenings every Monday. I went along. The movie was amazing! 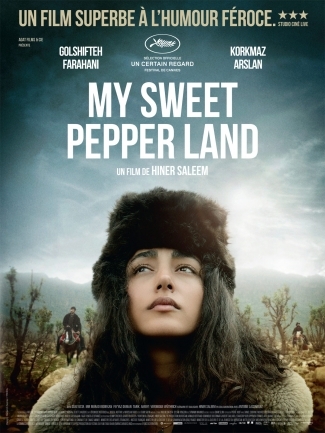 It was an Iranian film called My Sweet Pepperland. That’s the summary on imdb. It’s directed by Hiner Saleem and stars Korkmaz Arslan and Golshifteh Farahani in the main roles. Imdb has given ‘My Sweet Pepperland’ a 7.1/10 rating. I would personally raise it to an 8/10. I don’t know if I’m the right judge because it’s the first middle eastern movie I’ve seen but I really liked it. It shows Kurdistan as a newly formed country trying to form it’s laws and have a police force to ensure that the laws are followed. Of course, this process, as always, has its adversary in the traditions and norms that are deeply rooted into the minds of the citizens. We see the old ideals wrestling with the modern changes. The way that the people of the village cannot accept a female teacher, and the way they are unable to comprehend the friendship between Govend and Baran- it is something I can very much imagine happening. The doubt and mistrust is a part of being an Indian girl too but on a much much lower scale. At least, in the cities. What I really loved about the movie was the way the characters kept on fighting back. Right from Baran to Govend to the female Turkish Kurdish rebels. They were just tiny acts of rebellion (except for the rebels from Turkey and Baran towards the end) but it made me realize that not every rebellion needs a Mockingjay to be effective. Now, my Monday evenings are booked. I’ll definitely try and catch movies at Alliance. I am also trying to download a movie called ‘Kilometre Zero’ by Hiner Saleem again. It is a roadtrip movie that takes place in the Kurdish land.